Now Available! Original Framed Giclée Canvas Print Reproduction of Artwork by Nancy Zieman, using only the highest quality Giclée printing techniques. The randomly selected winner of the Nancy Zieman’s NEW! Afternoon Picnic Fat Quarter Pack is Julie Kopp. Her comment is: Using your great instructions, I started and finished the first block of this quilt. It went together very easily and looks like the picture. I’m looking forward to the block next month. I like “Front Porch” the best because the scene uses the primary colors in cheery tones and is inviting–I wonder what lies beyond the window. Peak Color! They are all wonderful and inspirational, like the woman who created them. They are all beautiful. I chose “Front Porch for first”, because that is where I would love to be with my handiwork right now. I like the “Moon lit Birches” a close second for the calmness it gives. They are all so gorgeous it is hard to choose one over the others. I have so enjoyed Nancy’s PBS shows with her tips and sharing ideas. Each canvas print is captivating, but Moonlit Birches is really stunning and one would never tire of seeing the canvas on a wall. Moon Lit Birches is my favorite. I could never get tired of looking at that picture!!! They are all beautiful, but my favorite is Peak Color. I love the colors of fall. Even though they are all lovely, my favorite is Front Porch. Front Porch, but they are all beautiful! Peak Color is my favorite. Fall is my favorite time of year! Front Porch! I think of the enjoyment Nancy had doing this quilt. So hard to pick one. They’re all so beautiful. I think my favorite is the front porch. Out on a limb reminds me of my grandmother’s cherry trees. Moonlit Birches is absolutely stunning. They are all beautiful. I love the Moon Lit Birches. Definitely Moonlit birches. But I really love them all. Moon Lit Birches strikes me first because it gives that solitary feeling of quiet. But they are all beautiful. Moonlit Birches is my favorite. You can almost hear the quiet. It’s a little lonely but so crisp and clean. Makes you wonder where all the little creatures are hiding. My favorite is Out on a Limb. I love seeing the dogwood trees in the spring and this captures that image. I really like Moon Lit Birches the most. It’s very serene and leaves me feeling calm. Of course they are all fantastic so picking a favorite was difficult. Out on a Limb is my favorite because it reminds me of the cherry blossoms around the reflecting pool in Washington, D.C.
My favorite is Out on a Limb. 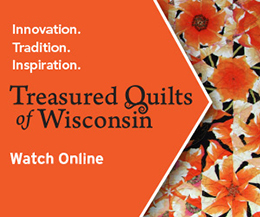 I was fortunate enough to see the original quilt at Quilt Expo in September and fell in love with the use of color. The print is a very good depiction of the original. I love them all but the Front Porch is especially meaningful to me! I always love a porch on houses and has been my wish to have one on our home, however, with that said a picture like this is heartwarming even if I never get the real thing! I love Nancy Zieman shows, tutorials, and all she brought to us on PBS. Peak Color is my favourite. Front Porch is pretty too. Peak Color is my favorite: it reminds me of the bluffs at the edge of my childhood home farm. Birches are my favorite trees. In all seasons and times of the day they exhibit the most beautiful color and movement. My first favorite landscape from Nancy is Moon Lit Birches. The fall colors in her landscape Peak Color also appeal to me. I love the way the designs overflow the borders. My fav is Front Porch a go to spot for hand sewing at my home. The front porch is my favorite as it is cheery and welcoming. I think it would brighten up any room . I love the Moon Lit Birches. We had birch trees in our yard and also on my grandparents farm and I am drawn by the stark beauty of the bark. Nancy inspired me to try my hand at landscape quilting and although my attempts don’t begin to rival her beautiful scenes, I very much enjoy creating them. They are all beautiful. If I had to choose just one, I’d choose Out On a Limb. The delicate flowers draw me in. I’m usually a Spring or Summer person, but for some reason Peak Color is the one that keeps drawing me in. I loved watching her on tv, or taking one of her classes at Puyallup Sewing Expo, and being inspired to make a landscape quilt. Perhaps I will get it started one of these days! The Front Porch, having met Nancy several times, you always felt like she was the kind of friend you would enjoy her company just sitting on the front porch having a glass of lemonade. All of the quilts are lovely but peak colors speaks to me the most – Mother Nature in her full glory. That is a really hard choice, but I will have to say Peak Color. Nancy gave me so much sewing inspiration over the decades I watched her show. I enjoyed meeting her on several occasions at the Sewing Expo in Beaver Dam. I like them all but Peak Color really speaks to me. It has to be my favorite. They’re all beautiful, but I think the moonlit birches is my favorite! The Front Porch….where I would love to be sitting right now! Moon lit birches is my favorite. They are all beautiful quilts. Hard to pick one favorite, but I’m going to say ‘Out on a Limb’. I loved watching Nancy make everything she did, but my favorites were her landscape quilts. I hope to TRY to do one someday. She was a delight and a bright shining star, and she will live on in her books and videos, and in our hearts. RIP sweet lady.